Little Bit Funky: for the record. good moms can also have clean houses AND happy kids. a few weeks ago i had someone say to me, in reference to my relatively clean house, "yeah, i'd like a clean house too, but i like playing with my kids." really? did you say that out loud to me? well guess what...i play with my kids every day. i can also keep up with laundry and keep my house relatively clean. it's not because i am wonder woman or that i neglect my kids. it's because i am super organized. and i make it a priority over many other things. but never people. i'd like to think i am teaching my kids responsibility. i keep up with our dirty clothes because there are many who would love to have so many clothes. i wash and put away our dishes because many have to eat with their hands. i keep my home neat and tidy because so many have to live in dirt houses...or cardboard...or are homeless. we put away the toys at the end of their playtime because there are many kids who aren't afforded toys. i try to teach my kids a lesson behind every chore. "do what you HAVE to, so you can do what you WANT to". that's real life. you have to work before you get paid. my goal through all my actions through the day is to show God that I am THANKFUL for what He has given me and i want to take good care of it. and i want my kids to learn the same. my goal is to raise kids who aren't self-centered or think that their pleasure should come before anything else. which is hard work considering that society tends to tell us the opposite. we are a family, who work together toward common goals...and then we all get to share in the fun stuff. and we do have FUN. i promise. it's all about balance. and priorities. and life lessons. and life skills for that matter. i am, after all raising future husbands. all i am trying to say is that clean house or messy house. it's not what makes a mom good. if only it were that easy. Amen and amen. :) I so much liked this post and really appreciate your intentionality with your boys and your home. And I think its possible to have a clean home and have fun times with the kiddos. My mom did it. I've seen many women do it, even those working part-time outside the home. You are right, its about priorities. Blessings on you and yours! I want both a clean home and to play with my son (and I work outside of the home as well). I appreciate the sentiment behind your post very much and agree with you. My only hope is that since you are very organized that you can help readers like myself (who constantly are working at it, but feel like they are spinning wheels and exhausted) know what works for you so we can maybe give it a whirl? Thank you!!! I get this all the time. I always tell people who are trying to make me feel bad for having a neat, organized and clean home that my husband works extraordinarily hard to provide for us so it's only right for me to work just as hard to keep our house clean and teach our kids about taking care of the family home. Yes it hurts but most of the time I just remind myself that this person is just trying to make me feel bad so they'll feel worse. Well said! I agree while-heartedly! BTW, I am loving your blog! You and I do similar crafty things to help provide for our families and we both love the Lord. Match! This is great! Cleanliness is next to Godliness and I like to believe that He wants a house of order. There is more peace and less contention in my home when it's clean. I'm a better mom when things are clean. Call me weird but I have anxiety being in messes. Thanks so much for this. There's never a good reason to abandon either your home or your kids, and it sounds like you've got a great balance. Don't listen to rude people with big mouths. Very good lesson you are teaching, and i am sure that inconsiderate person was only saying what so many other's have said. I hope anyway, and didn't mean it to be hurtful. Love it! I wish I was better about cleaning the house but I just get so frustrated that it gets messy 5 seconds after I clean due to my 10 month old and 2 year old! Love your comment about raising future husbands. I have 2 sons and I need to continue to remember that I need to teach them to be wonderful men when they grow up! Well, that poster could not apply to me more. No matter how much I clean there's always some spot in our floors that's sticky and burnt pizza cheese in the oven. But in spite of it all, my 2 boys are happy! I have been on the other side of this :( "I have a clean house and teach latin full time and homeschool my 10 kids why cant you do such and such" I guess the danger comes with any blanket statement. We all need a lot more Grace. Thank you so much for writing things out, and then sharing it with the world. If you didn't share stuff like this, then I wouldn't come across it. And it is something I would definitely love to ponder more about and reflect on. Totally, totally agree with you on this one!!! My house is not always perfectly clean but it's usually pretty tidy and I hate it when I feel like since my house is clean then I'm not a good mom... in fact, it's actually kind of a ridiculous concept. I also think it's okay for me to let my children play on their own while I fold a load of laundry!! Thanks for hitting it on the nail!! Crystal, you don't have to defend yourself. I too have a) a clean house and b) time for my kids. It's all in how you organize things. I have had remarks like that too and you know what ? I got the feeling that some of those women are just jealous that they can't manage their household like we do !! And if you think some more about it, that's rather pathetic ! I mostly agree with your post, but there is one part of the balance equation you are missing. Work. Do you have an actual job besides all that goes into raising kids and cleaning house? (not to downplay that responsibility). If no, add that into your routine. I'm sure you'd feel as overwhelmed and out of control as some of your readers who have commented. What kind of constructive advice can you offer to people who are struggling with being organized? I recently saw a bunch of mom friends posting on facebook about trading purses for diaper bags and stylish haircuts for pony tails and having dirty clothes because the baby spit on them but none of that matters because they are a mom and thought...."I dont think so!" Same here. I work 4 days a week, have a mostly clean house, and wear clean clothes. Does that make me a bad mom? Not at all! My husband and I also go out sometimes without our kids! Gasp! But I think all of these things make me a better mom because I am not stressing over a messy house and such. I do love that your are raising husbands also. You are a great mom! What else ? Oh yeah, when I have some minutes left (just before going to school and work for example) I fold some laundry or do some ironing. My mama was wonderful at teaching me how to keep a home clean. For that I'm so so grateful, but I don't remember her playing very much with us which I know she regrets. That balance is hard to figure out sometimes for me. I love that you said you are teaching your boys how to be future husbands, I will tuck that away as we raise our two little men. Some weeks I'm better at it than others, I try to have a home where people can drop in and I don't have to worry, especially given the place we live, where this is happens regularly. But some weeks it's tough, so I'd love to hear you share some of the things that work for you? I'm always up for learning new ways to stay organized. Blessings. I love this post...my children are 20 and 18, they have learned that if you work as hard as you play all will be well in life! Some people need an excuse to be lazy and the kids end up being the scapgoat...You go girl...keep setting a wonderful example for your children. It pays off trust me! awesome. i love this. raising future husbands.....something to definitely keep in mind. you ARE a wonder woman.....all moms are :) thanks. I actually love this sign. To me it doesn't say anything about basic organization or neatness, but highlights that some of those jobs aren't always the most critical. I have a neat house, usually manage to prepare home cooked meals, and do most of the keeper-of-the-home things that I think I should do. However, I do often choose to do something with my kids rather than some housekeeping task. For me, those things are cleaning the oven (really, it cleans itself for the most part and getting inside an scraping it all down takes a long time) and folding laundry. I do fold laundry; it just seems like I am never done! In addition to managing all aspects of the household I also work part time, run daily, coach sports 2 out of 4 seasons, volunteer weekly at school, serve on the PTA Board, serve on the HOA. So, I don't really give myself a hard time about chicken nuggets for dinner once in a while or constantly having piles at the bottom and top of the stairs of stuff to go up or down. I don't think it makes me a bad mom that I never get everything done. That I always have a pile of laundry to fold. Or even that this morning, my poor husband had to root through said pile to find clean socks. I don't think that any more than I think I'm a good mom for any of the other things that I do manage to finish. I do the best that I can and recognize that nearly all other moms out there are doing the best that THEY can. All we can do is support each other and cheer each other on...and NOT judge other women for what they can/can't (or do/don't) do. I love this!! 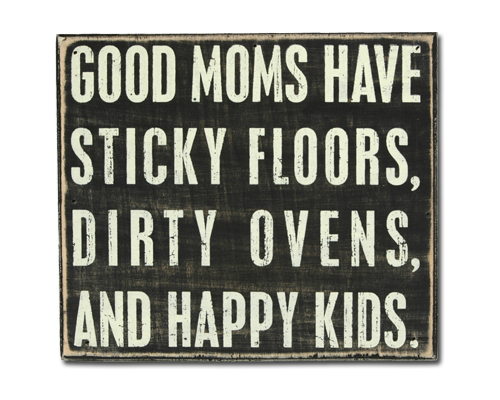 I have been saving this in my google reader since I first read it :) If I see one more "Good moms have sticky floors...etc." on Pinterest I will scream! Why isn't there a witty little comeback that we can pin? ?